Product prices and availability are accurate as of 2019-04-16 13:59:54 UTC and are subject to change. Any price and availability information displayed on http://www.amazon.com/ at the time of purchase will apply to the purchase of this product. 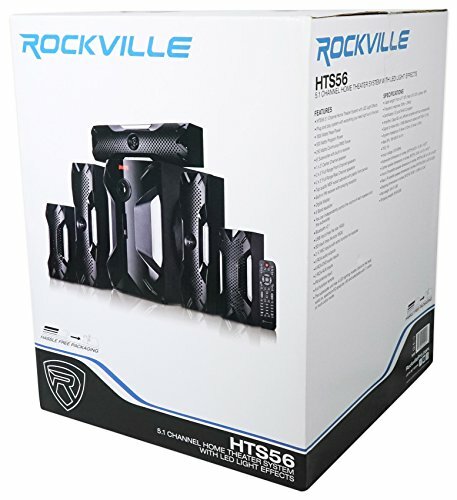 We are delighted to offer the brilliant Rockville HTS56 1000w 5.1 Channel Home Theater System/Bluetooth/USB+8" Subwoofer. With so many available right now, it is wise to have a brand you can recognise. The Rockville HTS56 1000w 5.1 Channel Home Theater System/Bluetooth/USB+8" Subwoofer is certainly that and will be a superb purchase. 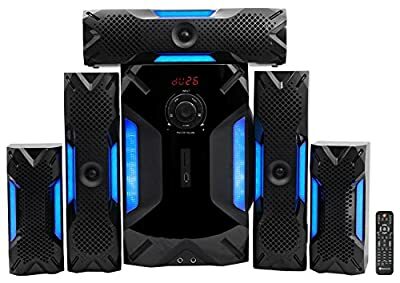 For this great price, the Rockville HTS56 1000w 5.1 Channel Home Theater System/Bluetooth/USB+8" Subwoofer comes highly recommended and is a regular choice amongst many people. Rockville have provided some excellent touches and this equals good value. The Rockville HTS56 5.1 Channel Home Theater System is the solution to your surround sound needs. The system is capable of 1000 watts peak power and 500 watts program, with 250 watts continuous RMS. We tested this system and it really hurt our ears. It's crazy loud! 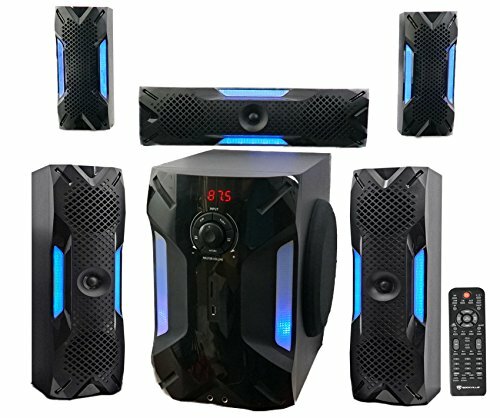 This complete home theater system features two full range 3” front speakers, two full range 3” rear speakers, a center speaker, and an 8” subwoofer. The speaker cabinets are made of strong MDF material and not particleboard like some systems out there. Each speaker has its own volume control so they can be adjusted independently. We include long length cables with RCA connectors. 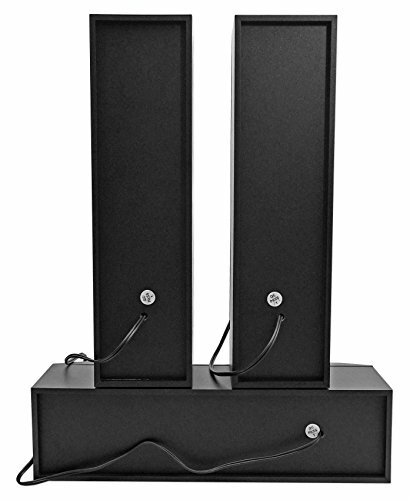 This allows you to quickly and easily mount the speakers wherever you want. One thing worth mentioning about conventional 5.1 channel systems is that when you play music using bluetooth or the radio or even other non HD sources you only get sound out of the two front speakers. 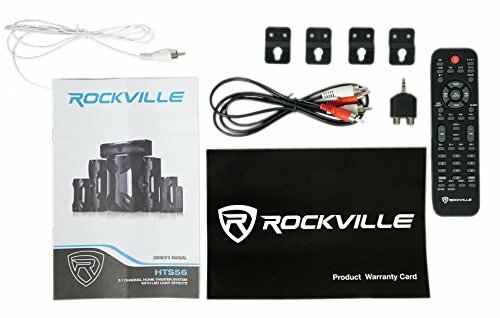 With the Rockville HTS56 you can listen to music using any source and all 5 of the speakers and the subwoofer will always play together. You will get surround sound whether you are listening to music, watching a movie, or using the radio. The 8” subwoofer provides super clear deep, rich bass with no rattling or discernible distortion even at high volumes. It has a built in media player/receiver with digital readout, a 5-band EQ, FM radio, Bluetooth, SD/USB input, and two ¼” MIC inputs with echo control for Karaoke on the front. On the rear you have 5 RCA audio outputs, 6 RCA DVD audio inputs, 2 RCA AUX inputs, and an FM antenna input. There are also 5 RCA inputs to power each speaker's LED. A full function remote control is included so you never have to leave the comfort of your chair. The system also features an LED light system with multiple modes. The subwoofer LEDs can be set to blink to the beat, look like an EQ spectrum analyzer, or change colors (constant or cycle). The satellite speakers have cool blue LEDs that can be turned on or off.